I have included this article, sent to me by Myles Garcia, author of “Thirty Years Later”, as I strongly believe the Philippine education system has betrayed the youth of today by glossing over or ignoring completely the abuses and excesses of the Marcos era. It is this wholesale “rewriting” of history that has sadly allowed so many young people today to view those years through rose-tinted glasses as something of a “golden age”. But, for those of us who lived through it, who did not benefit from being a Marcos “crony”, this total distortion of the factual history, the continued promotion of false achievements during that time, is a crime in itself. I welcome the Ateeneo professors speaking out at this time. Others should too. And rather than continue to offer the pathetic excuse, “We must not look at the past, we must look to the future” Bong Bong Marcos should face reality, address the wrongdoings of his family, apologize profusely to the people and promise to make amends. 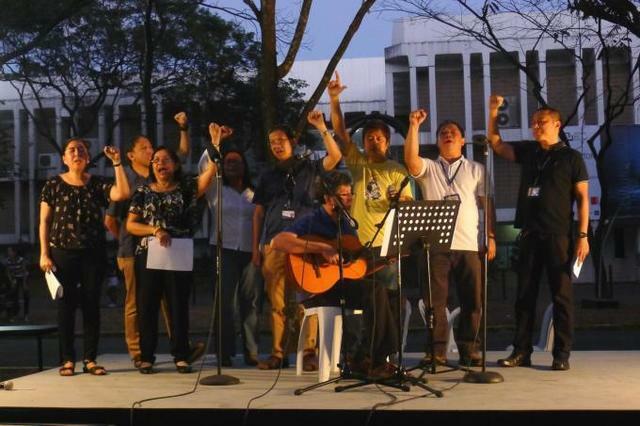 A statement titled, “We are not blind to the darkness and oppression of the Marcos years”, was signed by at least 412 faculty members and released Wednesday, March 2. Signatories from different departments, including several from the history department,refuted the vice presidential candidate’s claim that the Marcos years were good for the country. “The Marcos regime’s economics of debt-driven growth was disastrous for the Philippines,” they said. “The regime was not interested in inclusive development, long-term state-building, nor genuine social transformation of the country, despite its ‘New Society’ rhetoric,” they added. This included Bongbong Marcos’ recent calls for a hero’s burial for his father. “We reject any attempt to give Ferdinand E. Marcos a hero’s burial at the Libingan ng mga Bayani,” the signatories said. The faculty members also reiterated the need for justice for victims of martial law abuses and the need to pursue recovery of the Marcoses’ ill-gotten wealth. “The Marcos dictatorship should be remembered as one of the darkest periods of Philippine history. We reaffirm our responsibility as teachers and professionals to keep the spirit of EDSA 1986 alive by imparting to the young that the structures, actions and ideas – including the many lies – that allowed the Marcos dictatorship to impose and perpetuate itself, should be eliminated and never again be allowed to flourish,” the statement said.